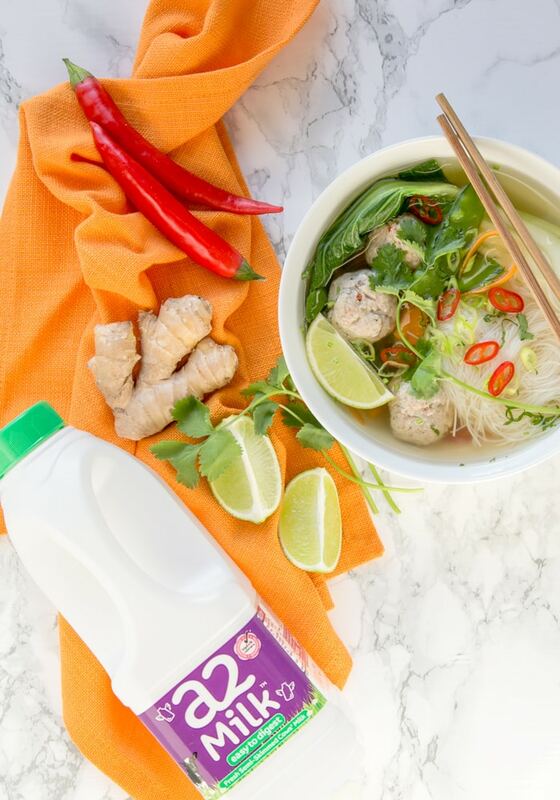 Get a wholesome and flavour-packed meal on the table in just 30 minutes with this hearty Thai Turkey Meatball Soup! 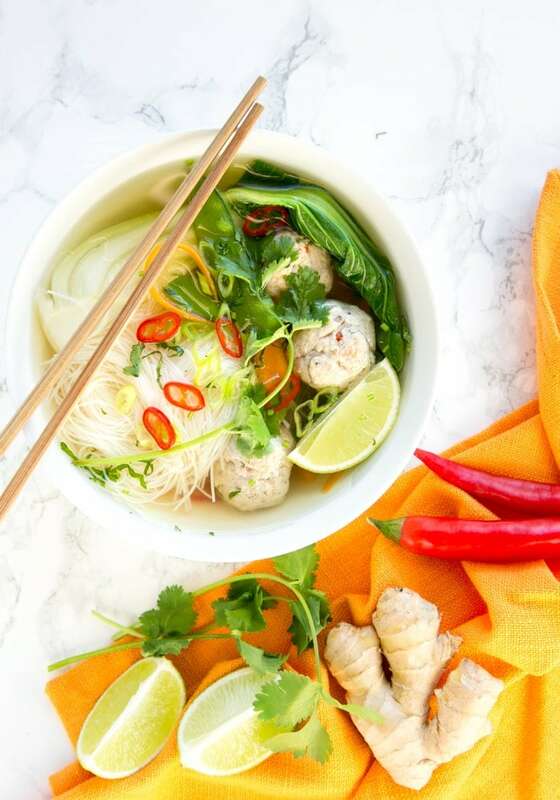 This Thai Turkey Meatball Soup is everything I’m craving these cold winter days. It’s warm. It’s slurpy. It’s deeply heart-warming and SO satisfying. It’s one of those feel-better soups, whether you feel a bit under the weather, or just need something comfy and tasty to warm you up on a cold day. This Thai turkey meatball soup has become one of my favorite things to eat this winter. It takes just about 30 minutes to make, so it’s perfect to quickly satisfy soup cravings. Flavour-wise, the vibrant Thai ingredients give a refreshing note, and the chili a nice spicy kick, resulting in a BIG bowl of flavor-packed soup. The Thai-inspired turkey meatballs are the REAL star of this heart-warming soup. They have green onions, lime, ginger, garlic, chili and cilantro folded into them, providing an extra awesome burst of fresh and bold flavor. To make the meatballs less “meaty” and nicely soft, I’ve added a few slices of bread soaked in milk, a trick I’ve learnt from my Italian mum. I had some gluten-free multigrain bread loaf at hand, and the seeds added a great crunchy texture (plus extra nutrients!) to my meatballs. If you have this kind of bread at home go for it, or just use any other bread you like (gluten-free bread, french baguette, Italian ciabatta, etc), and even better if it’s from the day before. To make things even lighter, I used fresh semi-skimmed a2 Milk™. I’ve been drinking this milk for years and cannot recommend it enough! The award-winning a2 Milk™ is simply pure cows milk which is naturally free from the A1 protein, so it’s easy to digest and gentle on sensitive tummies, like mine. 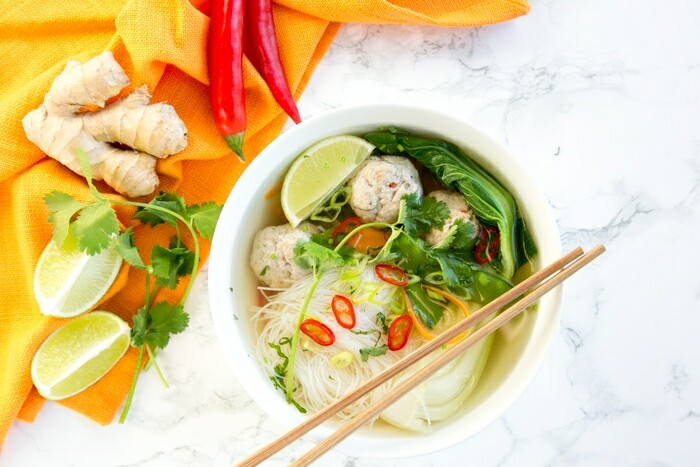 Now, let’s focus back on this incredibly tasty Thai turkey meatball soup. Once you’ve got your meatballs ready, all you need to do is drop them into the hot broth together with a few veggies, whilst in another pot, soak the noodles until ready to serve. Divide noodles, veggies and meatballs into bowls, ladle the broth over, and serve straight away. For an extra layer of flavour, top with fresh cilantro, chili and spring onion and serve with a wedge of lime. I highly recommend using a good quality broth for this recipe. It really does make a difference. A good chicken broth is easy to make at home. You can also make a simple but delicious vegetable broth, takes literally 5 minutes to put together, and tastes a million times better than store-bought. 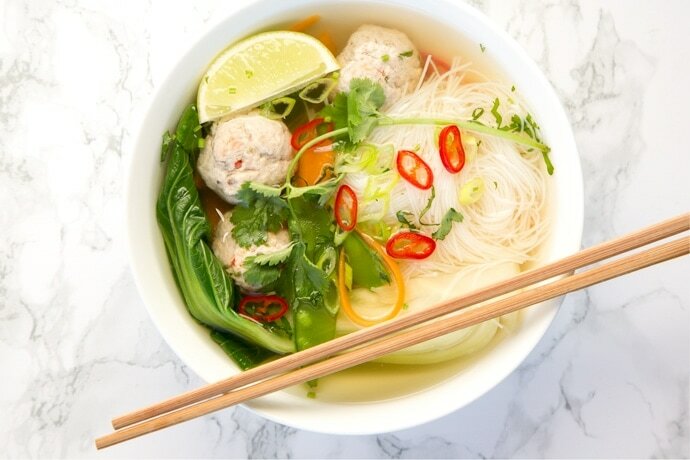 This Thai turkey meatball soup is simple, nutritious and awesomely gluten-free. 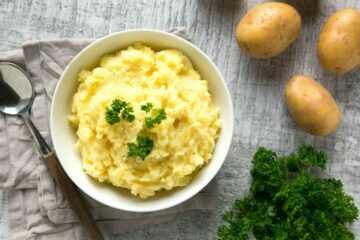 The perfect filling meal for cold nights, when all you really want to do is make a quick dinner and cozy up on the sofa! Looking for more Thai recipes to inspire your cooking? 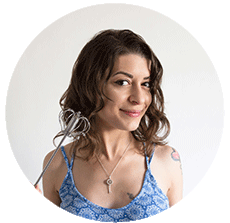 Check out some of my favorite Thai-inspired recipes. 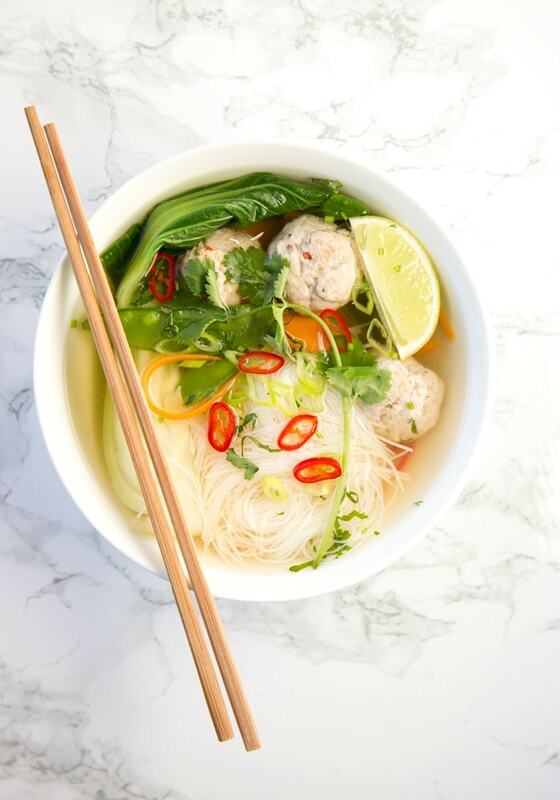 This nourishing Thai Turkey Meatball Soup is loaded with flavour and awesomely gluten-free. The perfect filling meal for cold nights! Place all the broth ingredients in a big pot and bring to a boil. Turn off the heat and leave to infuse while you get on with making the meatballs. In a small bowl, pour enough milk over the bread to moisten, and let it soak for 5 minutes. In the meantime, place the meat in a large bowl and season with a little salt and pepper. Fold in chopped spring onions, grated ginger, cilantro, lime zest and fish sauce, and mix together with the meat until well combined. Use your hands to squeeze the excess milk out of the bread, it should be soft and moist. 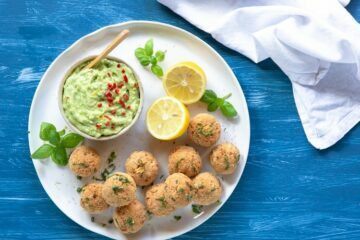 Tear the bread into small chunks, add them to the bowl along with the other meatballs ingredients, and mix until combined. Shape the mixture into tablespoon-sized balls, you should get about 20-22 meatballs. Drop the meatballs in the hot broth, cover and simmer for 10 minutes. Add pak choi, snow peas and carrots and continue to cook for an extra 5 minutes. Meanwhile, in a small pot, cook the noodles according to the packet instructions. Drain the noodles, divide between four soup bowls, and put 3-5 meatballs on top of each portion. Ladle the broth into the bowls, garnish with cilantro, spring onion, fresh chili and lime wedges, and serve. Yes! I love this! I’m a soup fiend right now and what a healthy and light way to enjoy a meal. I love that you have made your own broth too. I do that all the time and it makes such a difference. I love the sound of this soup and I’m all about those Thai flavors! I love soups for lunch in the fall and winter. This looks like it would be perfect addition to my regular rotation. Everything with rice noodle is also delicious under any circumstance!! Thai soups in specific and Thai food in general is also awesome! I LOVE your trick about the soaked bread in the meatballs! What a beautiful dish — it looks quite artistic! We love soups and this one sounds delicious!! 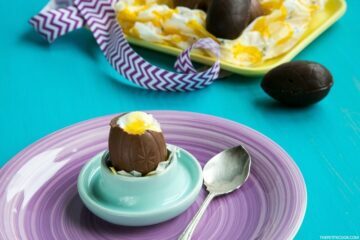 I’m definitely pinning this to make later on next week. Meatballs AND soup! Two of my favourite things for dinner. This looks so good! Sounds so filling and hearthy! How long does it keep? It keeps well in the fridge for up to 2 days, but make sure to cook the noodles separately! Those noodles and greens are calling my name! Love the look of this soup,and the flavors, although for me I’d switch a non-meat protein, like a tofu. Great idea to recover from the nasty flu. I loooooove Thai soups! I had something similar to this last week and it was amazing!